Former Saints and Lady Saints-Where are They Now? A number of former Seward County Basketball players are off to hot starts to their 2017-2018 seasons, playing around the country in NCAA Divisions I and II as well as at the NAIA level. – Two time Saint All-American Niem Stevenson has helped the Texas Tech Red Raiders get out to a 6-0 start this season. Stevenson has started all six contests for Tech, averaging 8.5 points and 3.3 rebounds per game. His best game of the season came in the Raiders last out as he put up 18 points on 6 of 11 shooting Saturday in a win over Savannah State. – Joining perennial NCAA power Oregon State this season is 2017 All-American Joanna Grymek. Grymek had her coming out part on Tuesday for the Beavers, putting up 16 points and grabbing 6 rebounds, both season highs against North Carolina Central. – Another former Seward start leading their team to an undefeated start is Tamara Seda at UTEP. Seda has been a beast for the Miners, leading the team in both scoring at 16 points per game and rebounding with 9 per night. She has put up double-doubles in each of UTEP’s last two contests including a 20 point, 10 rebound performance against Arkansas on Friday. – Joining Seda at UTEP is Neidy Ocuane who will likely miss the 2017-2018 season after a knee injury sustained in the Lady Saints quarterfinal win at the NJCAA National Tournament last March. – Along with Seda, the other half of the Lady Saints Twin Tower combination, Axelle Bernard, has transferred to Washburn to finish her playing career this season. She has helped the Ichabods to a 6-1 start, averaging 9.2 points and a team best 9.5 rebounds per game. In Washburn’s last game, Bernard pulled down 15 rebounds while also putting up 8 points and 3 blocked shots against Truman State. -After a 1,000 point career with the Saints, Charles Beauregard has taken his talents to Southwestern Oklahoma State where he is the leading scorer and rebounder for the Bulldogs, averaging 16.2 points and 5 rebounds per game. Beauregard didn’t waste any time becoming a star for the Bulldogs, hitting the game winning shot as time expired in Southwestern’s opening game of the season against Lincoln. – Coming off of a National Championship season a year ago, Daniela Galindo has the Oklahoma City Stars flying high again in 2017. Galindo is off to a fantastic start to her senior season, averaging a team best 22.3 points per game through eight contests. She was recently named the Sooner Athletic Conference Player of the Week after a 37 point performance Saturday against Our Lady of the Lake. – Known for her fierce skills on the defensive end of the floor, Rebekah Hatchard is finishing up her career at Montana State where she has played in all six games for the Bobcats this season. Hatchard is averaging 3.5 points and 2.5 rebounds per game for the Cats, scoring 5 her last time out against Wyoming Tuesday. – After two years in Liberal, Ernest Carter remained in state where he is playing for Kansas Wesleyan this season. Carter is off to a good start for the Coyotes, scoring 7.9 points and 6.4 rebounds per game through seven contests including an 11 point performance against Bethany last week. – Also at Kansas Wesleyan is Shania Liggett. Liggett and the ‘Yotes are 5-4 on the season with Liggett seeing action in a pair of contests thus far. – Last season’s breakout star for the Lady Saints, Erin Richardson has been busy for Delta State University this season, playing nearly 32 minutes per game through the Lady Statesmen’s first three games. – Leslie Speer has been a force in the Ottawa University lineup this season. Speer is second on the team in scoring at 10.7 points per game while tying for the team lead in rebounding at 6.6 per night. In a game earlier this season, Speer earned 17 trips to the free throw line against Baker, knocking down 15 freebies and finishing the game with a career best 17 points. – After a brief one year stop in Liberal that included a rash of injuries, Spencer Franklin is now donning the blue and white at Longwood University in Virginia. He played in his first game with the Lancers on Sunday, dropping in 4 points and grabbing 3 rebounds in 19 minutes of work. – 2015 Saint Marcus Mathieu has journeyed to South Dakota where he is at Mount Marty College. Mathieu has had his way for the Lancers thus far, averaging 21.7 points, 5.6 rebounds, and 3.0 assists per game, all leading the club. He has topped the 25 point mark three times this season including a career best 28 against Bethany earlier this month. – The rifleman, Delano Jones has returned to the court this season for Cameron University where he has played in all six and started four games for the Aggies. Jones is averaging 6.8 points per game thus far while connecting on 35% from downtown. – Manuela Fungate is at Belmont Abbey College in North Carolina, still awaiting her first action on the floor for the Crusaders. 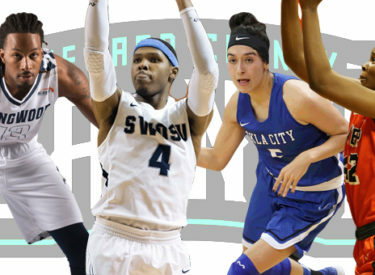 – Clitan de Sousa is with Saints Athletics Hall of Famer Jim Littell at Oklahoma State University, but will likely miss the 2017-2018 season as she continues to recover from a knee injury sustained last season. – Alex Tyson is in her second season at Bethany College in Lindsborg. Tyson has played in all 10 games for the Swedes, putting up 6.3 points and 4.1 rebounds per game. She scored a career high 17 on 6 of 8 shooting last time out against Central Christian on Tuesday. – 2013 Saints All-American Kaheem Ransom has become a star overseas, averaging 16 points and 5 assists per game over the last two seasons while playing for Mgzavrebi in the Republic of Georgia. Last season he was an All-League selection in the Superleague and was also named to the All-Imports Team. This season Ransom will move to the A League, playing for BC Titebi.